If you are running a blog or website and want to earn money online, then affiliate marketing is a way to earn money by selling products through your websites. Today in this tutorials with few steps, I will be show you how to register with snapdeal affiliate marketing and can start earning money online. click join now to start your registration process, after clicking join now fill-up the registration details form. 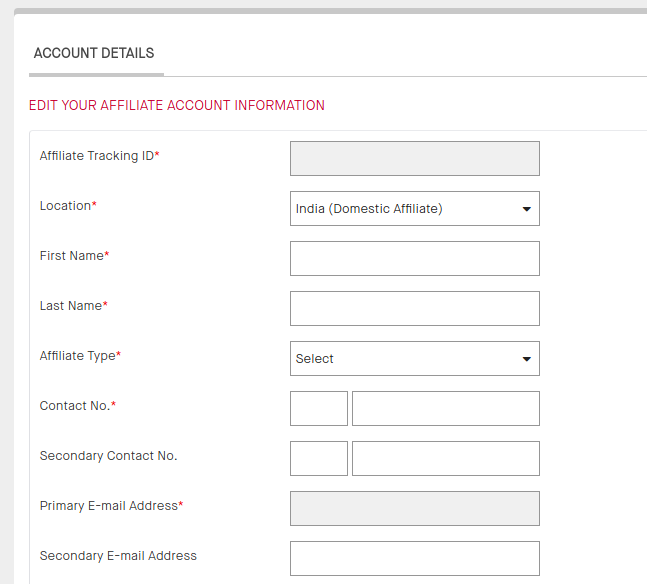 Edit your affiliate account information: fill up this section of the form with your personal details and contact details. After completing this section you will find. Affiliate Payment Information: In this section enter your bank account details to transfer your payment in your account from snapdeal. In this section you will also have to upload your pan card for verification. Go ahead to the last section which is Affiliate Website Information. Affiliate Website Information: In this section enter your website URL and the type of your website and also select the approximate number of monthly visitor in your website. if nothing goes wrong, I mean if all informations are correct than you will be taken to your account home page. Congratulations, you have successfully created you snapdeal affiliate marketing account. Now your can starting earning by placing ads from snapdeal to your website. 1. Write an Article: The best strategy that every bloggers adopt for selling products through their website is, write an article about the product and give links to your affiliate product in the article. So that people can read the article and if they find it right for them, they can buy it through your provided like and can give you a commission. 2. Share on social media: To spread your market a lot more you can post your article to the social media. If anybody likes your post they can come to your site to read the full article and also can purchase through your referral. 3. Email Marketing: Be careful Before starting email marketing otherwise you may be unsubscribed or spammed. To start email marketing it is better if you have a category based subscription. Where your can target your user and understand who has subscripted for which category. Only send emails of related topics of category. Thus through email marketing you can spread your articles and make users to buy the products. 4. Making Videos: If you can, your can make a video regarding the product and upload it in your YouTube channel. Link the video in the article and post it in social media, spread through emails and so on.